Just wanted to let you know that this yummy little breakfast treat is sponsored by my friends over at Crofter’s Organic! This tender, moist Gluten Free Coffee Cake has a tasty blackberry swirl and is loaded with a crunchy, crispy crumble topping! It’s sure to be a hit! If you really want to get me out of bed in the mornings PRONTO, just promise me carbs. And, if we’re being specific here, they should be tender, moist carbs in the form of gluten free COFFEE CAKE, which MUST have a VRY VRY heavy LAYER of buttery crumbles on top and a THICK layer of sticky-sweet fruit spread in the middle. Serious about that crumb topping. The ratio of topping to cake better be some along the lines of 3:1. We do not mess around. This is not a drill. You know, I never understood why they called it coffee cake when I was growing up and didn’t drink coffee. It didn’t have coffee in it, and it kind of just tastes like a muffin but, you know, shaped like a cake. Then, adult Taylor had a slice of gluten free coffee cake W-I-T-H a mug of steamy-cozy-morning coffee and HOLD THE PHONE. Coffee cake IS probably the most perfect little side of carby comfort to accompany a cup of joe. So, yea, I WILL get out of bed for it. Whether it’s Saturday or even on a MONDAY. I’m there. 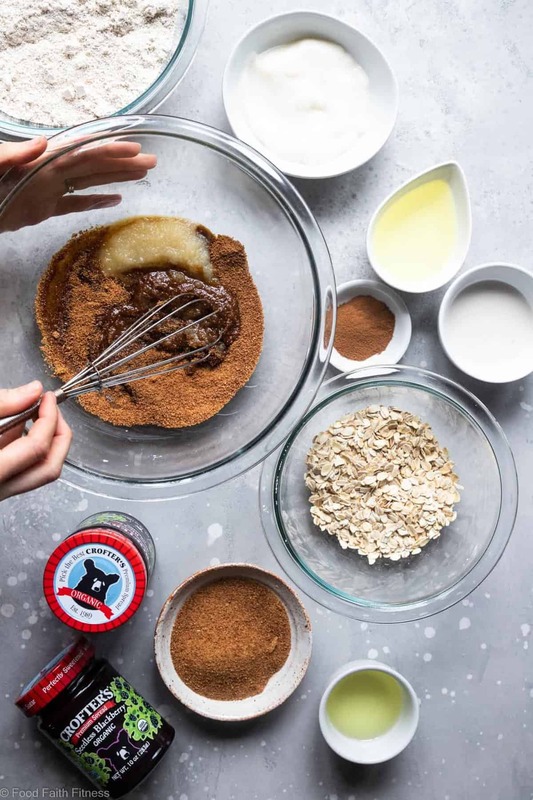 This vegan coffee cake recipe, MAN OH MAN. Both Mr. FFF and my roommate, Emma, declared it one the best things I’ve ever made, and they haven’t said that since the mulled red wine cake of 2018. It has this pillowy-soft crumb that is kept extra tender with a tasty trifecta of creamy, dairy free vanilla yogurt (to keep it a dairy free coffee cake!) applesauce and this hint of coconut oil that is, UGH, just SO DANG GOOD. 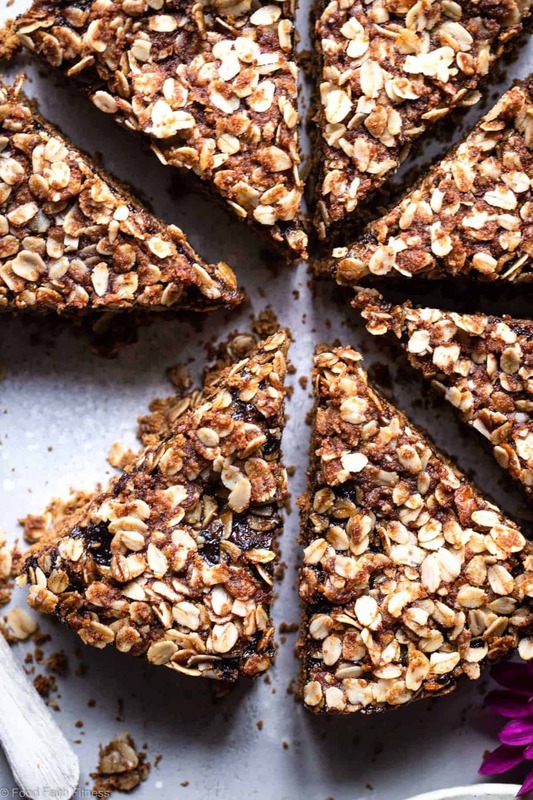 Then there’s the crispy, crunchy, coconut-oily crumbs that fall all over your lap as your yogurt coffee cake-loving-mouth munches, but you do not even care one bit because nothing can distract you from the current coffee cake situation that you currently find yourself in. Besides, maybe you’ll find some crumbs stuck to your shirt later. SNACKS. Can we press pause on the crumbs for a second though? Because we have some blackberry BUSINESS to banter about. 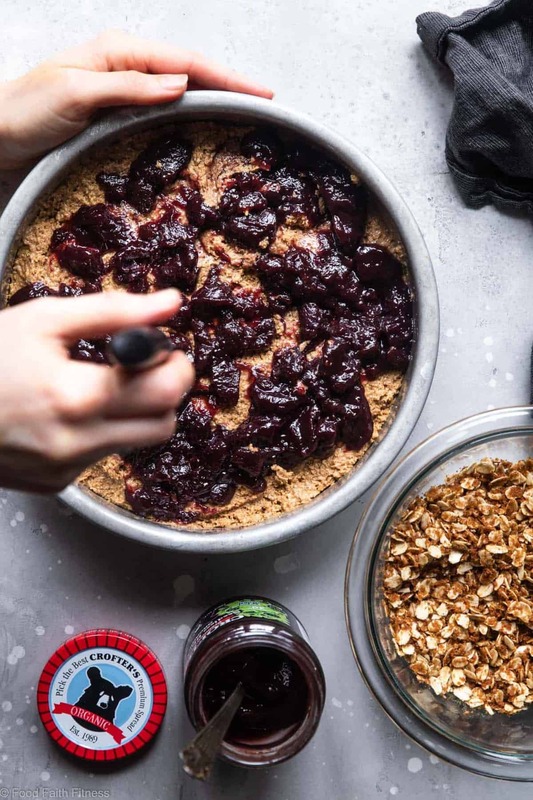 All cozied up between the tender layer of pillowy soft coffee cake and the heavy-handed sprinkling of crispy oats lies the REAL star of the gluten free vegan coffee cake show: Crofter’s Organic Blackberry Premium Spread! I’ve been using Crofter’s fruit spread for a LONG time because they are all just so dang good. I always have apricot, strawberry, raspberry and blackberry on hand <– Put blackberry or raspberry with cashew butter on an English muffin. You’re welcome. They really are a “fruit spread for all” because there are SO many flavors (even unexpected ones like pomegranate and black currant!) and they also offer different varieties. Today’s Blackberry spread if part of the “premium” line! Their premium spread has less sugar, more flavorful fruits and is made with organic ingredients and Fair-Trade cane sugar! Tastes good. Good 4 U. You could also try their “just fruit” line which has no refined sugar! They use low color and low acidity white grapes to press into concentrated juice with no flavor, and then add that fruit based sweetness instead of sugar! They’re a touch tarter but still super delicious and have just as awesome flavors! Can I use other flavors of fruit spread? Absolutely! Crofter’s has so many flavors available. I think this coffee cake would also be awesome with apricot or wild blueberry fruit spread! Rise and shine sunshine, your morning just got a little brighter. 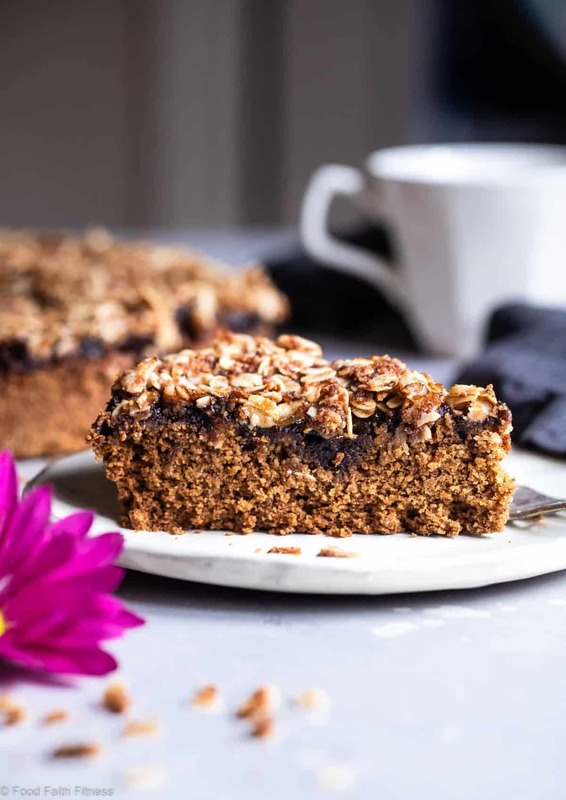 This tender, moist Gluten Free Vegan Coffee Cake has a tasty blackberry swirl and is loaded with a crunchy, crispy crumble topping! It's sure to be a hit! Line the bottom of a 9 inch cake pan with parchment paper, rubbing the sides with coconut oil. Heat your oven to 350 degrees. In a medium bowl, stir together the oats, baking powder, cinnamon, baking soda and salt. In a separate large bowl, stir together the coconut sugar, yogurt, applesauce, oil, almond milk and vinegar. Add the dry ingredients into the wet ingredients and stir until combined. Pour into the prepared pan, spreading out evenly. Drop the fruit spread all over the top of the batter and use a sharp knife to swirl it in. In a medium bowl, mix together the oats and sugar. Add in the oil and use your hands to mix until crumbly. Spread the crumbs over the cake, lightly pressing them in to stick to the batter. ** Because there is no eggs, this needs to cool COMPLETELY to give it structure, or you won't be able to get it out of the pan. HIS POST IS SPONSORED BY MY FRIENDS AT CROFTER’S ORGANIC. THANK YOU FOR ALLOWING ME TO CONTINUE CREATING GREAT CONTENT FOR YOU BY SUPPORTING PARTNERSHIPS WITH SUPER-FAB BRANDS THAT FOOD FAITH FITNESS LOVES TO WORK WITH! AS ALWAYS, OPINIONS REMAIN 100% MY OWN! My goodness, I love coffee cakes and this one does not disappoint! All of those yummy ingredients mixed with blackberries sound so delish! It’s such a tasty combo Sylvie! 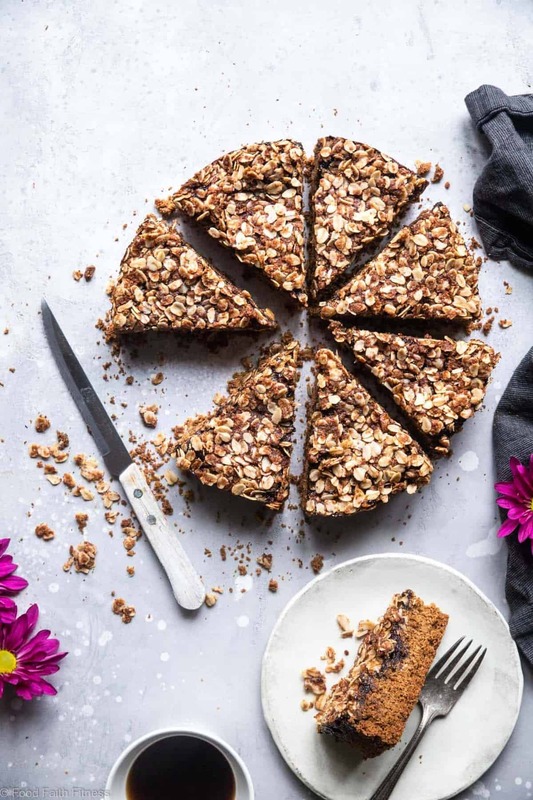 Vegan Coffee cake looks fun-tastic with great photography. 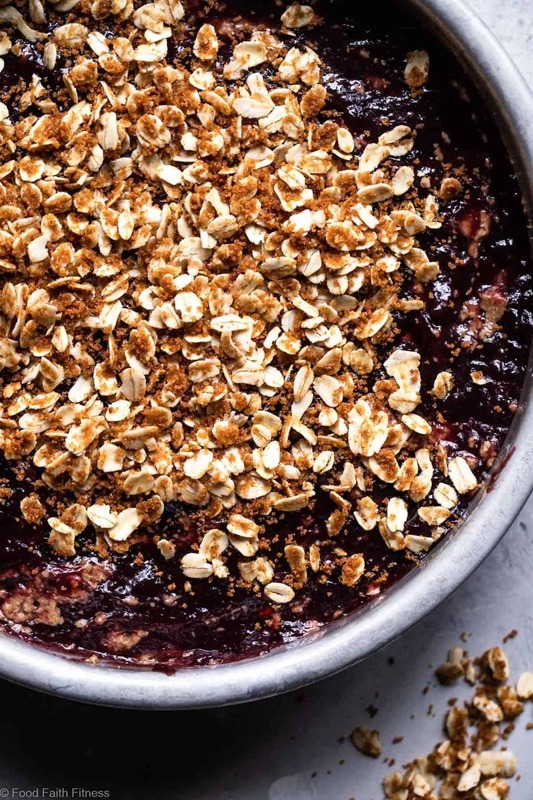 Loving the Blackberry crumble topping for crunch ! Just the thing to have with my morning cup of coffee. Yum! Thanks for sharing. 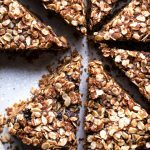 This coffee cake looks absolutely delicious, and I love the fact that it’s GF made with oat flour! I am drooling just looking at this cake! Have pinned it as well! Amazing recipe and amazing photography! This looks fabulous!! I really don’t bake with blackberries enough, but this cake looks simply delicious! I could just go for a slice right now with my morning coffee! I hope you try it Annie! I have never had blackberry with coffee cake, but it sounds amazing! oh my this sure does sound delicious. I am loving all the flavor here – it would be just perfect for a nice weekend breakfast! What a delicious looking cake! I love the sound of it especially the blackberry swirl! The swirl is the best part! I can already see this coffee cake be a hit in my house! It is moist, tender, and it has that crumble topping that you won’t be able to find anywhere else. Delicious! I will also jump out of bed for a warm piece of coffee cake. I’ve never tried a fruit spread in the center but its such a great idea.